It’s that time of year when leaves are falling! 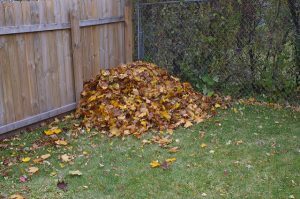 We gardeners have choices: let the leaves remain where they’ve dropped; use them elsewhere in our landscapes; rake, bag and drag them to the curb to be added to the landfill; burn; or compost them. Although the City of Asheville collects bagged leaves, in much of Buncombe County you must bring bags to the landfill and pay a fee. Our landfills are becoming increasingly full, made up of 20% to 30% food scraps and garden waste, according to the EPA. Burning is not permitted in the city. The county allows burning of yard waste only at designated days and times, and where there is no public trash pickup. Depending on your location, you may need a permit! 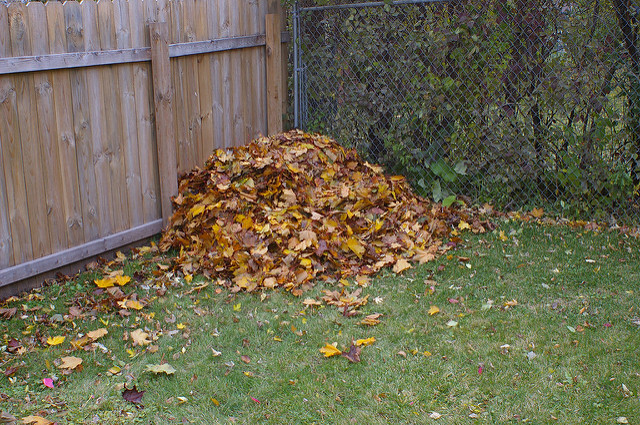 If you aren’t using leaves elsewhere in your yard, start a compost heap and make “black gold” for your garden! Compost is the material that results from the decomposition of biodegradable materials. Composting is easy, doesn’t add to the landfill, enriches the soil while helping retain moisture, and reduces the need for chemical fertilizers. It’s all about the soil. 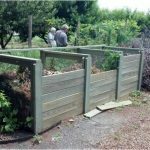 Composting replenishes soil nutrients that help plants grow, slowly releasing major nutrients (nitrogen, phosphorous, potassium) for gradual use by plants. It loosens clay soil and helps sandy soil retain moisture. Use compost as a mulch at the base of plants, or dig it into the soil when planting. 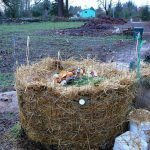 Compost is an ideal soil amendment for gardening uses. It can take from 3 months to a year to produce good workable compost, depending on the method used and how often it is turned. A composting area is ideally located in a semi-shady, level place which will be convenient to use, but is over 6 feet away from your house. A compost pile is made of roughly equal proportions of “green” and “brown” materials with enough water to keep things damp and ready to decompose. Greens are nitrogen-rich ingredients such as vegetable and fruit scraps, coffee grounds, egg shells, and grass clippings. Browns are carbon-based materials, such as dead leaves, branches, and twigs. You can include newspaper, but make sure it does not exceed more than 10 percent of the total weight of the material in the compost heap. Layer greens and browns in roughly equal proportions, moistening the pile as you go. The materials will compost more quickly if they are chopped into small pieces. Turning the layers periodically will speed the breakdown process. Animal products such as meat or bones, grease, or dairy products. These can attract rodents. Dog feces or similar waste that may contain parasites. Diseased plants or plant material that have been treated with pesticides or herbicides. Glossy magazines often have toxic pigments and should not be used. Orange peels and other citrus rinds, corn cobs, and nut shells which break down very slowly. Any plants that contain intact seed heads. 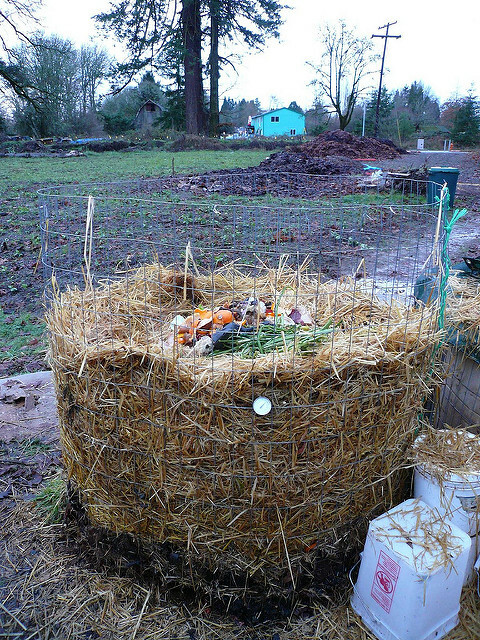 If you don’t want a simple compost heap, you can use a variety of compost structures. 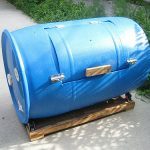 One is a circular ring of closely woven metal fencing material about 4 to 5 feet in diameter with chain clips for fasteners. These can be unsnapped for ease in turning the pile. A very user-friendly method is the three-bin structure, which uses a kind of assembly-line process. Place three bins next to each other in a row. Make each 3- to 5-foot square bin of sturdy fence wire, held in place with either metal or rot-resistant wood posts. 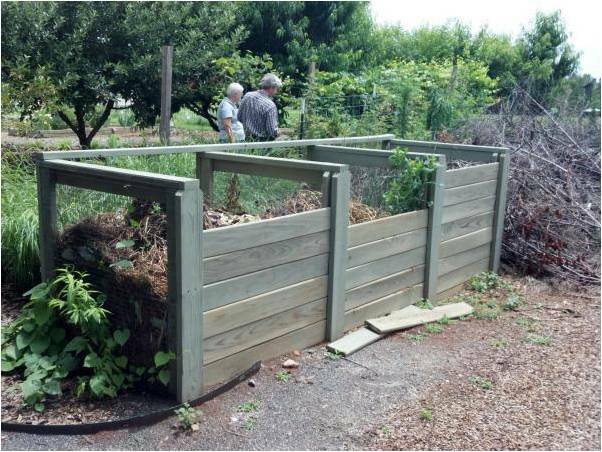 Using removable slats in the front of each bin keeps the area tidy, while allowing easy access to turn the compost. Start the fresh material to be composted in the first bin. Turn it into the middle bin after a few days of “cooking,” and put a fresh batch in the first bin. Finally, move the middle material to the third bin until it is finished compost and ready to use. 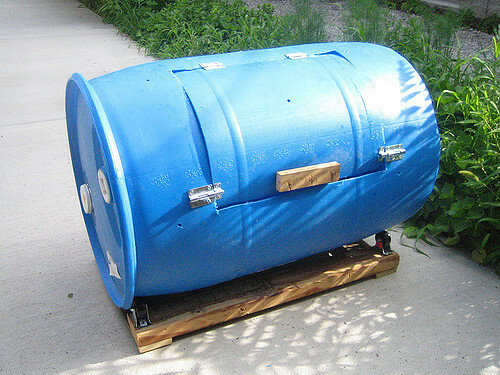 Plastic drums which rotate are also available. While they make turning the compost easy, the drums can get heavy and hard to turn when full. Your compost is ready when it is dark brown, has a light and crumbly texture similar to potting soil, and has a pleasant earthy scent. It takes just a little effort to do so much good for your soil and for our environment! In South Carolina Low Country kitchens, there is an inviolate rule when it comes to making shrimp and grits: Start with good shrimp. What does this have to do with gardening in Western North Carolina? Everything. To make a healthy, productive garden, start with good soil. 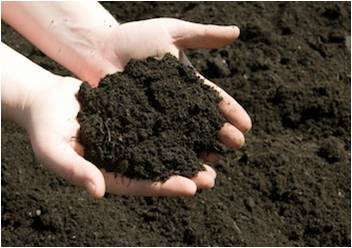 Think of soil as a mixture of solid material (minerals and organic matter), air, and water. 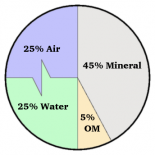 The ideal soil contains 50 percent solid materials, 25 percent air, and 25 percent water. Healthy plant growth depends on 18 nutrients in this mix. The primary nutrients include carbon, hydrogen, and oxygen, as well as nitrogen, phosphorus, and potassium. Secondary nutrients are calcium, magnesium, and sulfur. Micronutrients are iron, chlorine, manganese, boron, zinc, copper, molybdenum, nickel, and cobalt. K for potassium, which helps with hardiness and disease resistance. Use a soil test to determine what nutrients your soil may need. 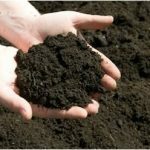 For more information about soil testing, see https://www.buncombemastergardener.org/testing-soil-advantage-free-testing-december-1-soil-sample-form-gardeners/. Regardless of what kind of fertilizer you use, be sure to read the directions, use the proper proportions, and follow the manufacturers’ safety guidelines when applying. Compacted soil has too little air. Poorly drained soil holds too much water. Adding organic matter can help remedy both. North Carolina Extension soil specialists recommend adding about 2 inches of organic matter—compost, manures and pine bark (less than ½ inch in diameter)—to make up about 25 percent of the top 8 inches of your garden soil. For clay soils, they say composted leaves (leaf mold) and pine bark are best—they do NOT recommend hardwood bark, peat moss, pine straw, sand, or wood chips. When soil texture and nutrients are in the right balance, plants, beneficial insects, and bacteria thrive. Think back to that bowl of shrimp and grits. We’ve got fresh and flavorful shrimp, but what about the grits? The best grits are smooth and have a consistent texture. The same holds true for soil. This means removing clods of clay and breaking up large clumps of dirt. The amendments and fertilizers are evenly distributed. Like a cake batter, your ingredients are well-mixed. Finally, rocks and debris are raked out and removed. The product is a luscious soil that is easy to turn, well-drained and rich in the elements that create a welcoming environment for your garden and all the organisms that support it. When the days lengthen and temperatures moderate, our heads fill with spring dreams of fresh lettuce, rosy radishes, and sugar snap peas. But before putting a seed in the ground, think of shrimp and grits. Work from the ground up: test the soil, then (like a good cook) add the necessary ingredients to make your soil the best it can be. It’s time well spent and your garden will show its appreciation all year long. Article written by Janet Moore, Extension Master Gardener Volunteer.